Young women could be a key political force during this election cycle. These women were taking part in the Women’s March on Washington on Jan. 21, 2017. The 2018 midterm elections are shaping up to be a watershed year for women and politics. Not only are a record number of women running for political office in 2018, but many of them are running campaigns that tout the underrepresentation of women in an effort to galvanize the women’s vote. MJ Hegar, an Air Force veteran and young mother running for Congress in Texas as a Democrat, said that “women are sick of” male elected leaders promising to protect women’s rights. Her biographical campaign ad, “Doors,” featured prominently the significant obstacles she faced as a woman in the military. This theme was also picked up by Alexandria Ocasio-Cortez, a Democrat from New York, who began one of her ads by saying that “women like me are not supposed to run for office.” Kelda Roys, a Democrat running for governor of Wisconsin, ran a campaign ad in which she breastfed her baby. Will such a strategy prove effective? Historically, women overall have never shown a preference for voting for other women merely because of their gender. Political scientists have long shown that party and incumbency matter far more in the voting calculus of female voters (and male voters, for that matter). But younger women could change that during this election. A recent Suffolk/USA Today poll found that nearly one-third of young women — those age 18 to 34 — would prefer voting for a woman over a man, compared with 19 percent of women overall. 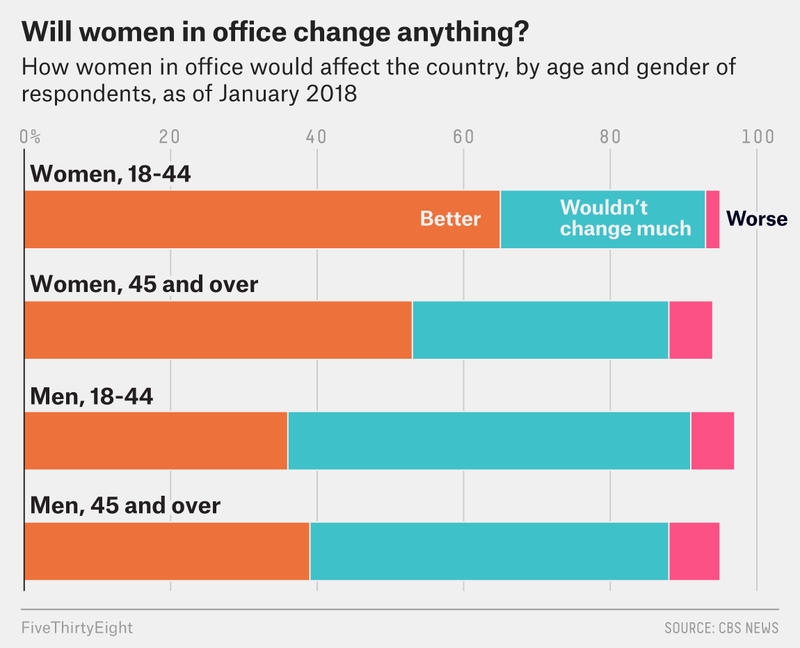 At first glance, these polling results are somewhat surprising, given that young women appeared more apathetic about Hillary Clinton’s historic candidacy for the presidency than older women did. In both of her presidential primary campaigns, Clinton was the second choice for young women, according to exit polls in certain states. In the 2008 Democratic primary, young women supported Barack Obama over Clinton. Eight years later, young women favored Bernie Sanders over Clinton by an even larger margin. But if young women expressed some ambivalence about Clinton’s candidacy in particular, they are now showing a greater interest in supporting female candidates more generally. A recent CBS News poll found that roughly two-thirds (65 percent) of women age 18 through 44 believe the country would be better off if more women were serving in political office. Older women (53 percent) and men overall (38 percent) are considerably less likely to agree. The same poll also found that 61 percent of young women say electing more women to political office is a very important priority for them, a view shared by only about half of older women. Why are younger women increasingly likely to express solidarity with other women? There are few explanations worth considering. The #MeToo movement has served as a powerful unifying force for women. Unlike other issues that affect women — like the gender pay gap, which primarily affects working women — sexual harassment crosses lines of culture, class and generation. It’s also fairly ubiquitous in American society: Eighty-one percent of women say they have experienced sexual harassment in their lifetime. However, the #MeToo movement has had a more profound effect on young women than older women. Compared with older women, young women are more likely to say the movement has affected how they think about sexual harassment and assault. It is also informing their political priorities, namely the election of more women to political office. But it’s not limited to politics. The increasing public attention to the problem of sexual harassment and assault is also affecting dynamics in the workplace. Americans have long expressed a preference for male bosses, but views are changing rapidly. In the past couple of years, the percentage of women saying they would rather work for a man has plummeted. Today, women are as likely to say they would prefer to work for a man as a woman. And younger women say they would rather have a female boss than a male one. The president’s role is also one that is difficult to ignore. Young women may wish to empower other women as a way to oppose the president. Trump is consistently viewed more negatively by women than men, but young women especially dislike him. In a PRRI survey from March, more than three-quarters of young women viewed Trump unfavorably, including a majority who had a very unfavorable view of him. It’s notable that this animosity is not only personal: In a January survey from CBS News, nearly 6 in 10 (59 percent) women age 18 through 44 said Trump’s policies were generally harmful to women, a view that was much less common among older women. A recent Pew report documented a dramatic swing in Democratic affiliation among millennial women, with 70 percent now identifying with or leaning toward the Democratic Party. Numbers may not add up to 100 because of rounding. Skeptics who question the potential of young women to usher in a new political era point out that young people, more generally, are less politically active than older Americans and that women, more broadly, are less likely to become engaged in the political process than men. But recent evidence suggests that Trump may serve as an effective antidote to the chronic inattention and apathy that plague younger voters. And young women appear particularly energized: A study conducted by PRRI and MTV released earlier this year found that young women were significantly more likely to report engaging in political activity than young men, defying historical trends. We often think of political eras as defined by the values, character and politics of whoever occupies the Oval Office. But political eras are also shaped by the forces that emerge to challenge them. Bill Clinton faced a robust and organized conservative Christian political movement, which dominated the conversation on sexual morality for more than a decade. Obama contended with the Tea Party movement that sent 60 members to Congress and moved the entire Republican caucus in a far more conservative direction. It is hardly a coincidence that the Trump era also witnessed the emergence of the #MeToo movement. If young women remain committed to empowering women, they, more than Trump, will be responsible for defining this era in American history.